We cruised south through the night. 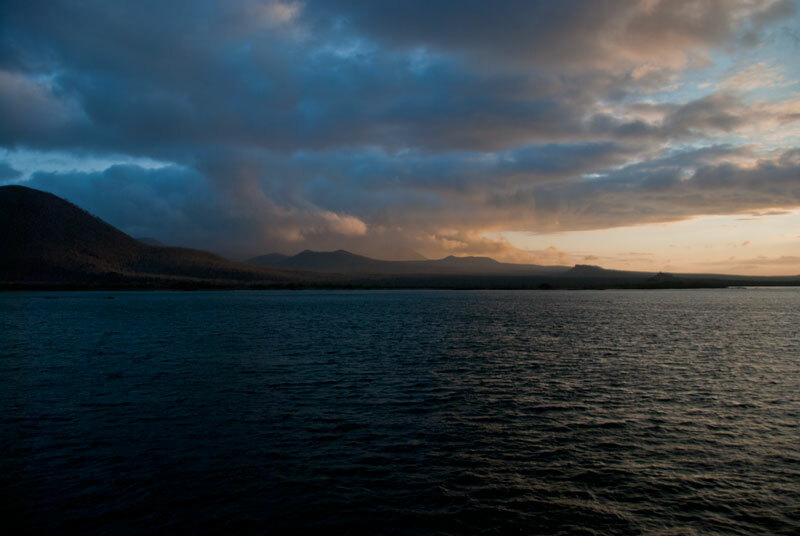 As the sun came up we were approaching the island of Floreana. 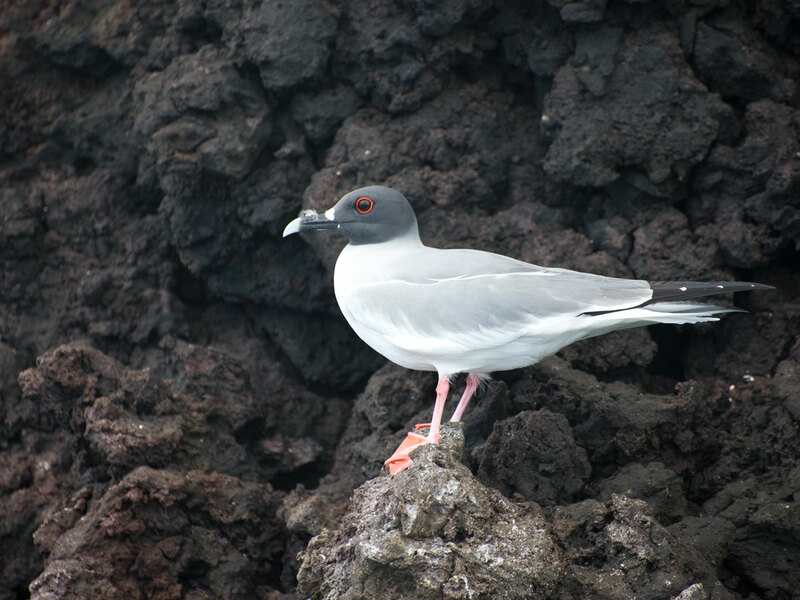 Floreana covers an area of 67 square miles and some of its volcanic cones, long dormant, reach upwards to 2100 feet. Little did I know, as I looked at the various volcanic peaks just being touched by the light of dawn, what wonders this day would hold. After breakfast we jumped back into the pangas and cruised along parts of the coast. 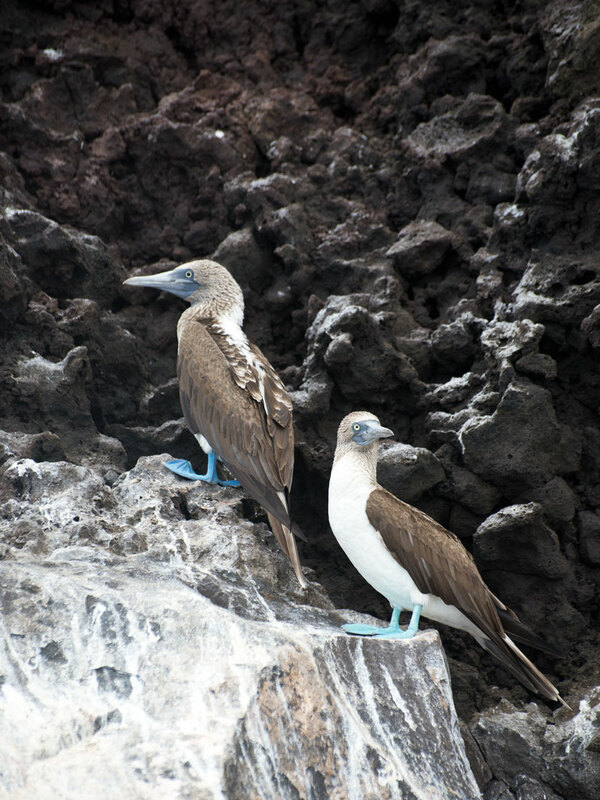 We saw Frigatebirds, our almost constant companions during this trip, roosting in trees. 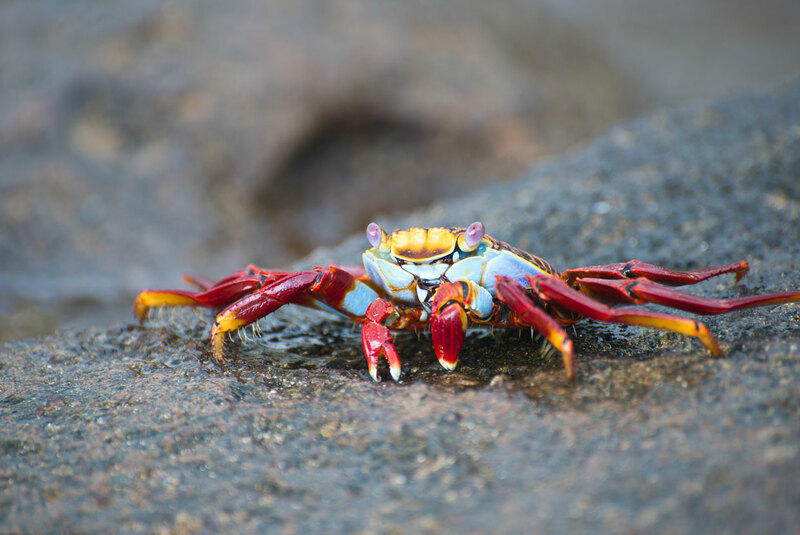 There was a glimpse of a marine iguana and then hundreds of technicolor Sally Lightfoot crabs crawling on the dark colored volcanic rock. 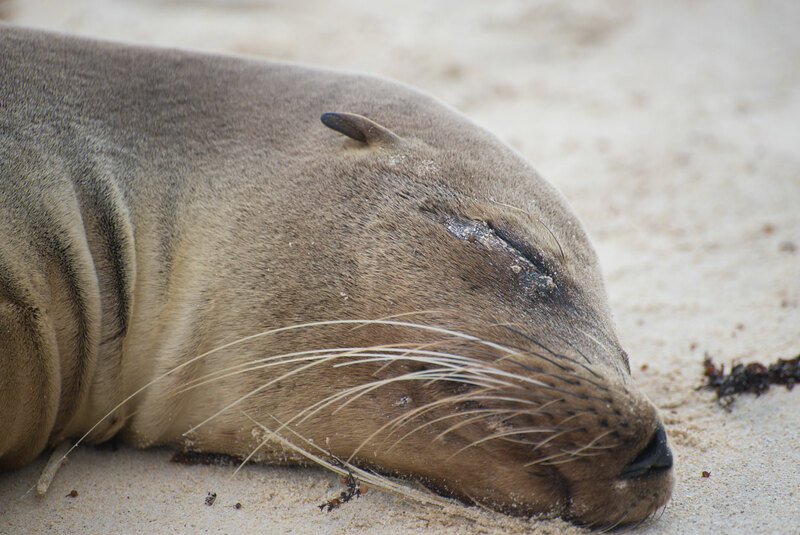 And all along the rock outcroppings and beaches were sea lions. 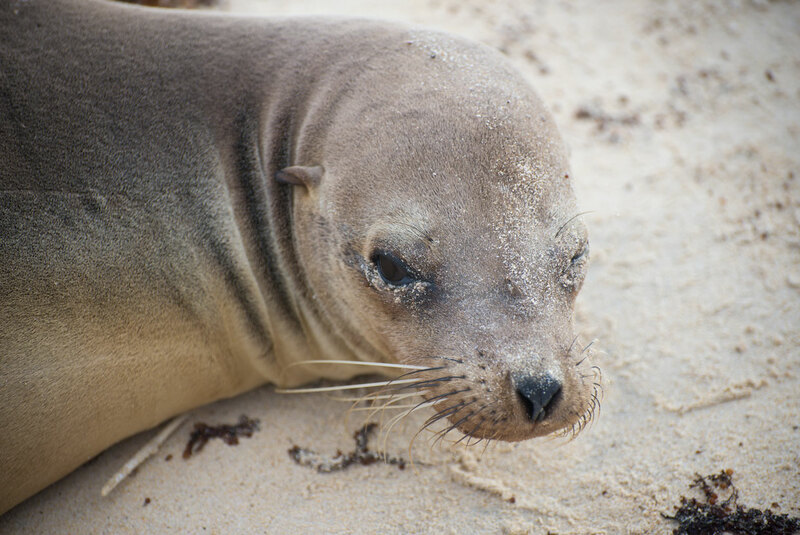 This was the sea lion pup who came out to greet us and play with us as we explored the shoreline via panga. 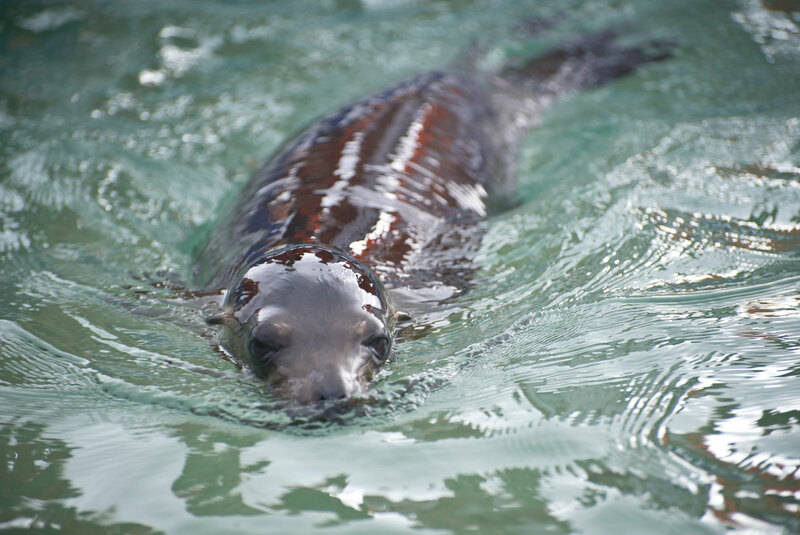 Galapagos sea lion pups are really curious. They tend to hang out together in a "nursery" in the shallows. They aren't afraid of humans. In fact, they will follow you in the water and try to play with you. 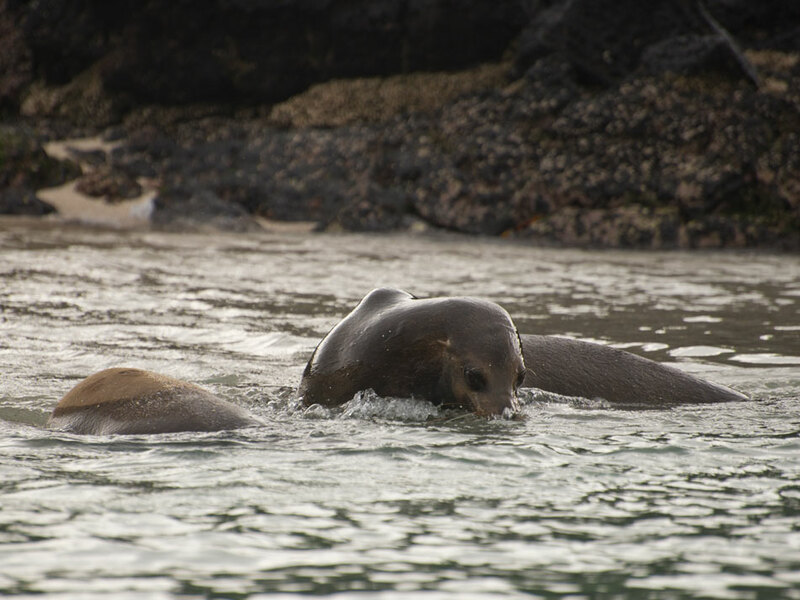 One came swimming right up to our pangas and had a great time grabbing the rope hanging off the bow, then diving under our pangas and bursting out of the water on the other side and just generally showing off its exuberant seal pup marine acrobatic skills. There were also green turtles every where in the water. You'd glimpse them coming up for air or in the midst of mating. We made a water landing at Post Office Beach, meaning the panga runs up into the shallows and you just jump out in the water and wade up to the beach. In the late 1700's, when whaling was a big industry, a wooden barrel was placed in this location. Outbound ships would drop letters here and returning ships would collect them and mail them home. This tradition continues and you can still drop off unstamped letters and postcards and then pick some up to mail home for fellow travelers. 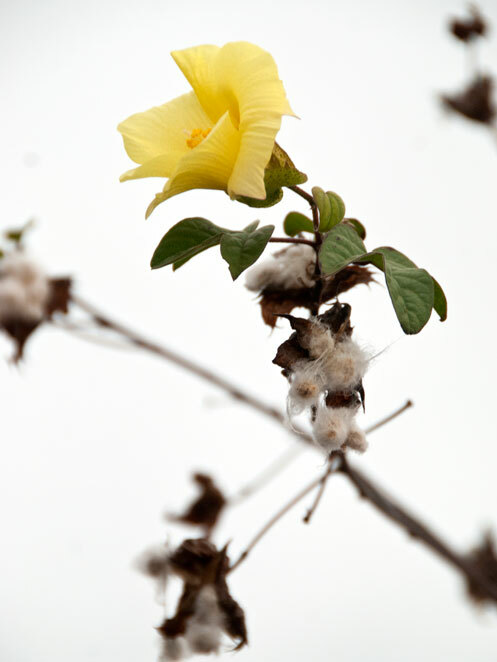 One last dry season bloom. The lava tube you can swim in, if you dare. A Galapagos Flycatcher making sure I got its portrait. 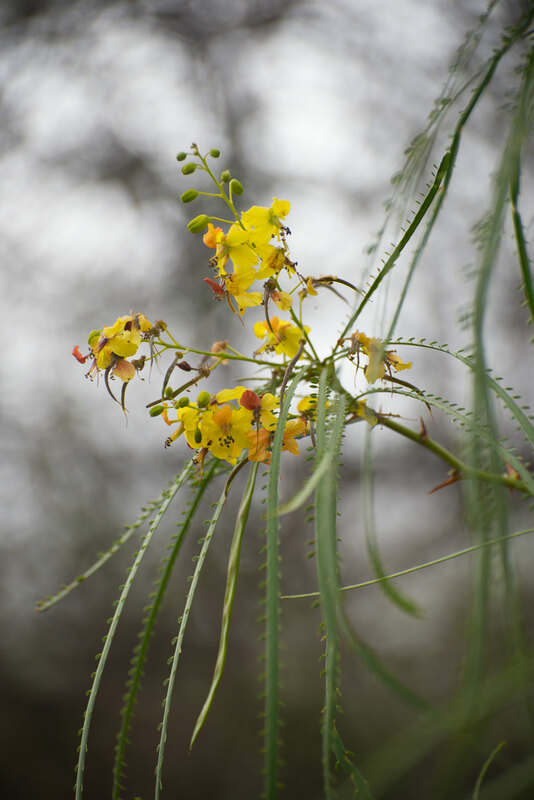 Another tree blooming during dry season. Hiking back down to the beach. 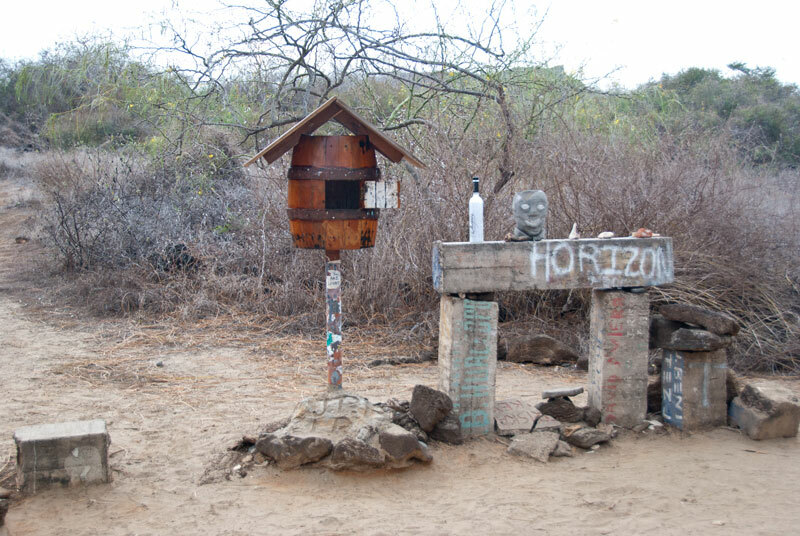 We then wandered up a dusty, dry trail leading from the beach to a lava tube. Bring a headlamp. 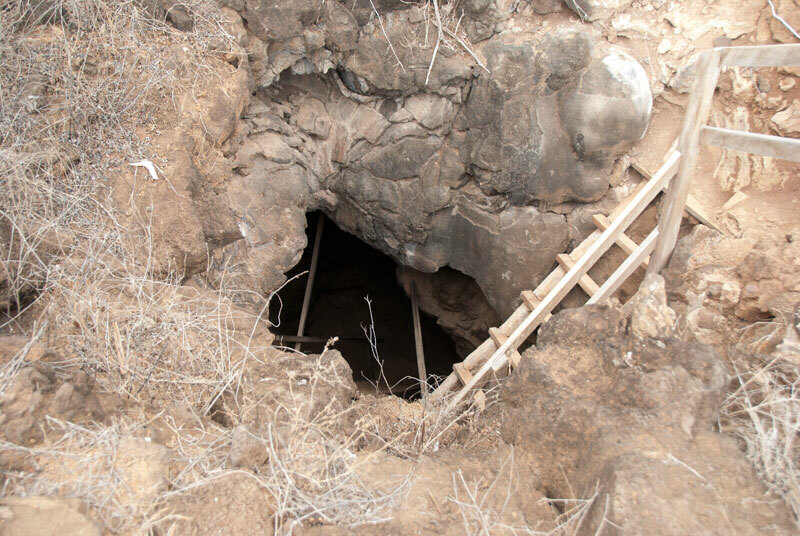 This lava tube is blocked by sea water at one end. You descend some rather steep stairs and then down a rocky slope holding onto a rope. This Traveler and Traveler 10 didn't make it all the way down. My newly uncasted foot wasn't up to the downward climb. You can swim in the sea water...in the dark. Traveler's Nine and Thirteen made the descent. 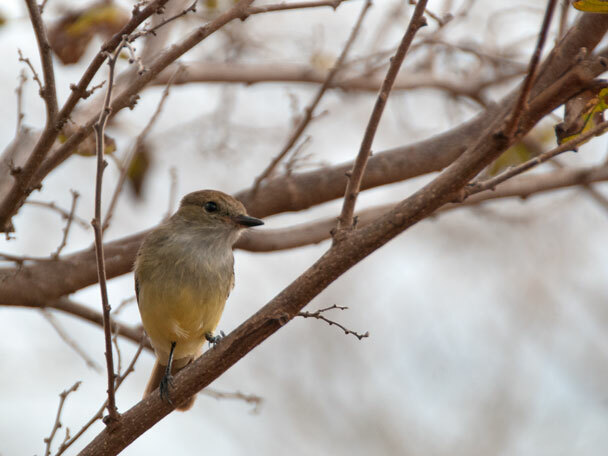 I spent my time taking photos of Galapagos Flycatchers and investigating what looked like an old Warbler Finch nest. Then it was snorkeling time on Post Office Beach. Traveler Ten and I headed out, once we cleared some underwater rocks we both unceremoniously wiped out on while trying to fully submerge. 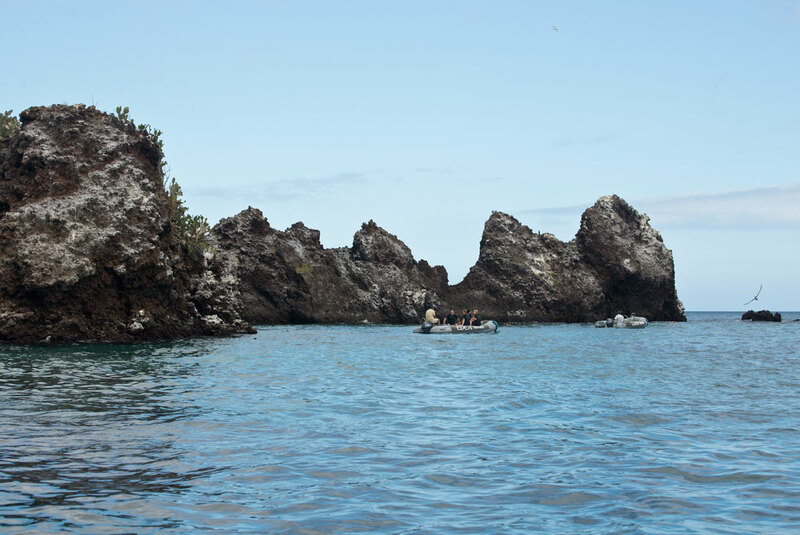 The water in this part of the Galapagos is pretty cool. Some people chose to wear wet suits. Being from New England and the generally cold to frigid waters we deal with all the time I didn't have much of a problem with the water temperature. 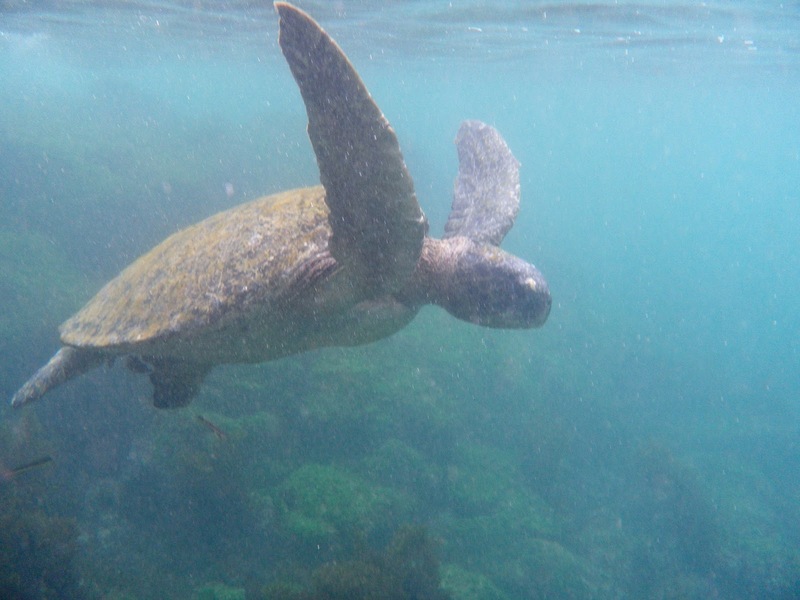 The magnificent Green Sea Turtle that swam with Traveler Ten and I. We swam along seeing the occasional fish. And then Traveler Ten sighted a Green Sea Turtle. It was the most wonderful, huge adult sea turtle. This was one of the most amazing moments of my life as I swam along side this turtle that was almost as big as me. It surfaced just in front of Ten and I, facing us. The turtle stared back at us rather unconcernedly. Thought it was only a moment that nanosecond of connection between turtle and human stretches in time in my head. In a way it was completely timeless. A perfect moment. 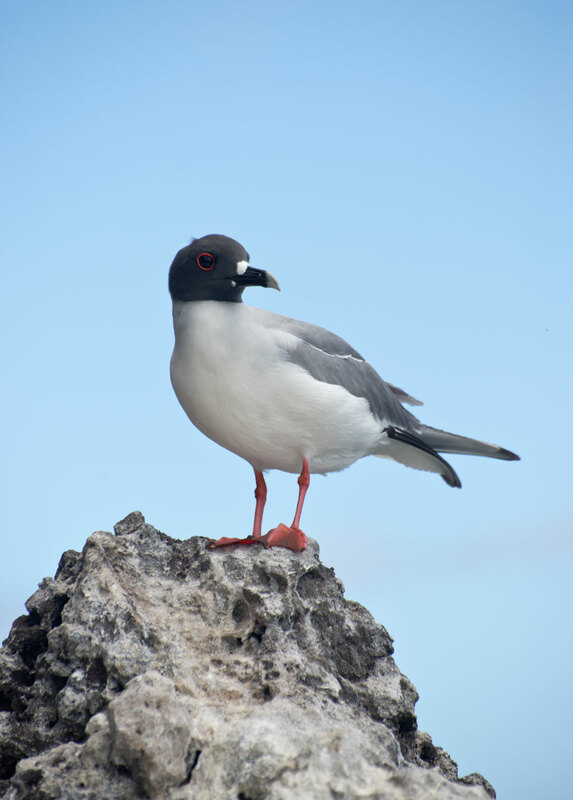 Then it dove again swimming gracefully below us and I swam following it as it grazed on sea grass and algae along the rocky sea bottom. 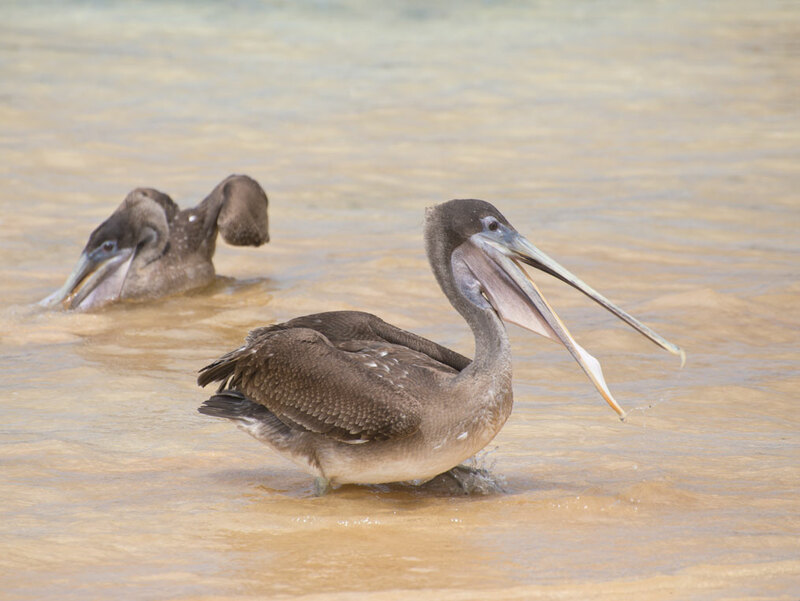 After snorkeling I documented the show a family of brown pelicans (female with two juveniles) were putting on in the shallows. Then it was back onto the pangas and back to the ship for lunch. Once we were fully stuffed full of very tasty fuel it was back onto the pangas to visit the Devil's Crown. Floreana. We hiked the area between the two highest peaks on the left side of the island. The Devil's Crown is a mostly submerged volcano. 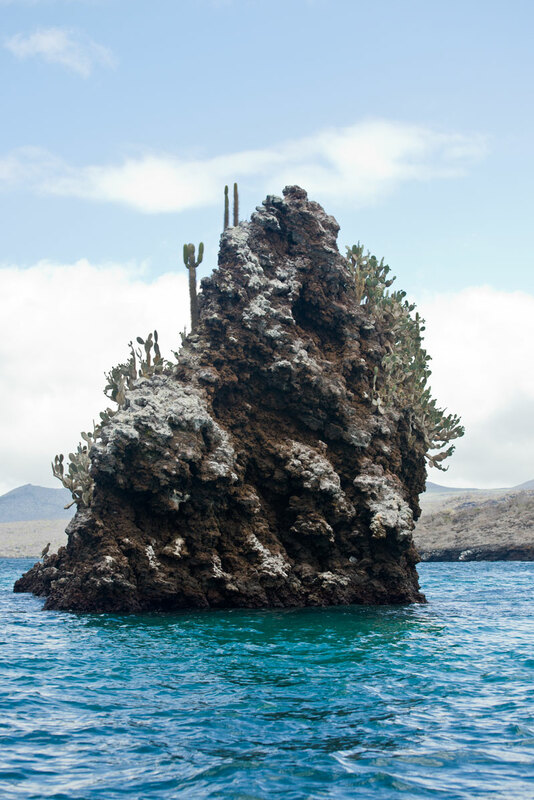 Just bits of it stick out of the water where sea birds and cactus cling in large numbers. Most of the passengers chose to snorkel again,. You can let the current take you around the rocks. 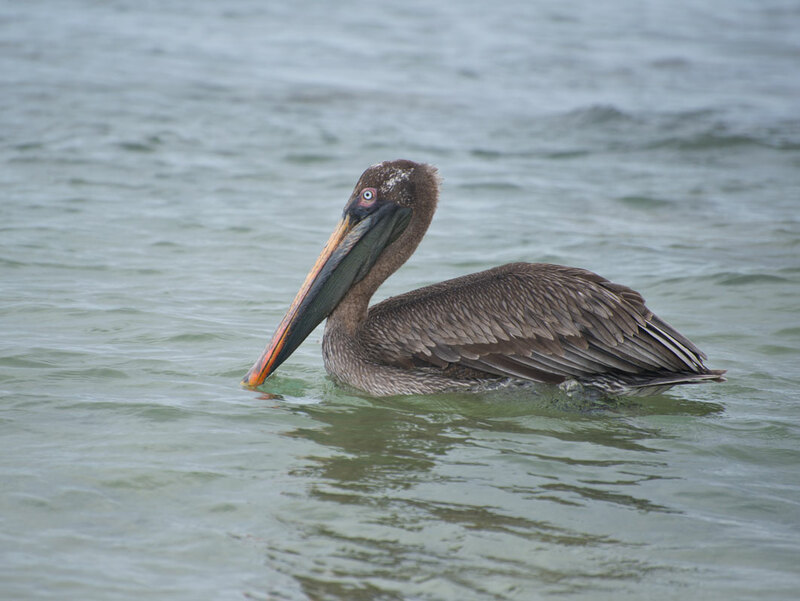 Its some of the best snorkeling in the Galapagos. We four travelers didn't snorkel. Myself, I was exhausted from the morning and too interested in watching for sea lions and sea turtles and taking photos of the Blue-footed Boobies, Brown Noddies, and the amazingly unusual Swallow-tailed Gull, which is the only nocturnal seabird in the world. Devil's Crown. Pangas picking up and dropping off people snorkeling. Prickly pear cactus and candelabra cactus making a home on the Devil's Crown. 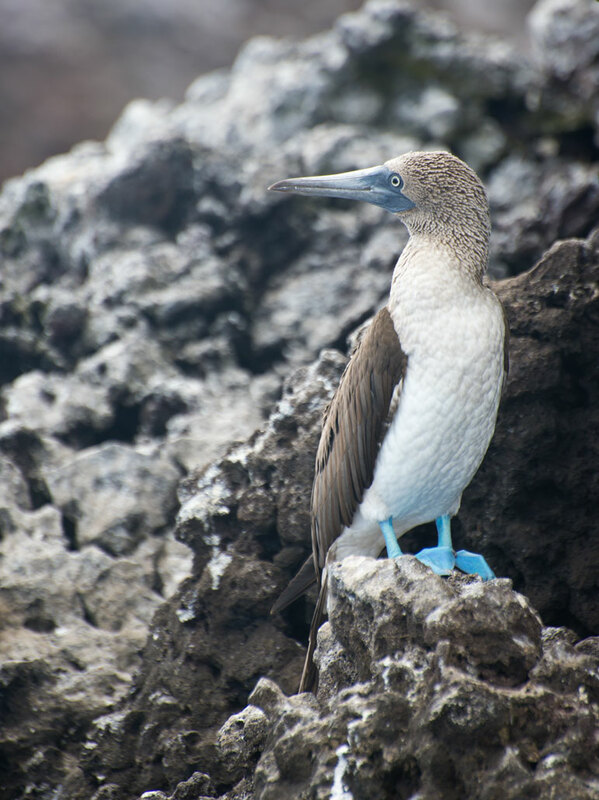 Blue-footed Boobie. Yes, their feet really are that blue. The name "boobie" comes from the Spanish "bobo" or clown. 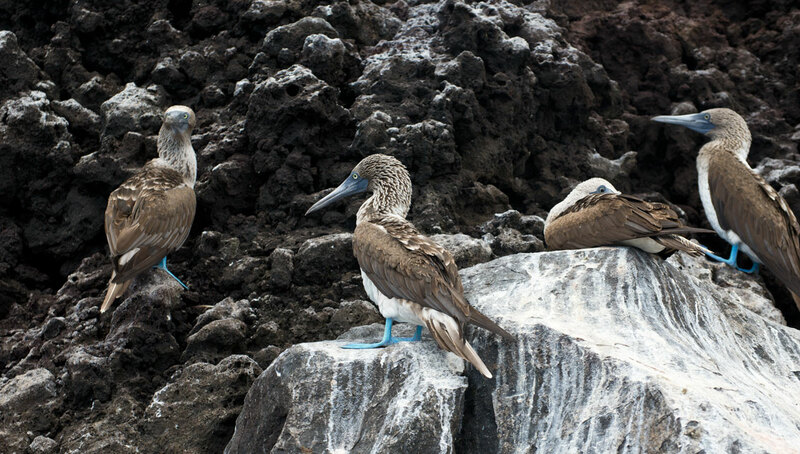 Blue-footed Boobie. 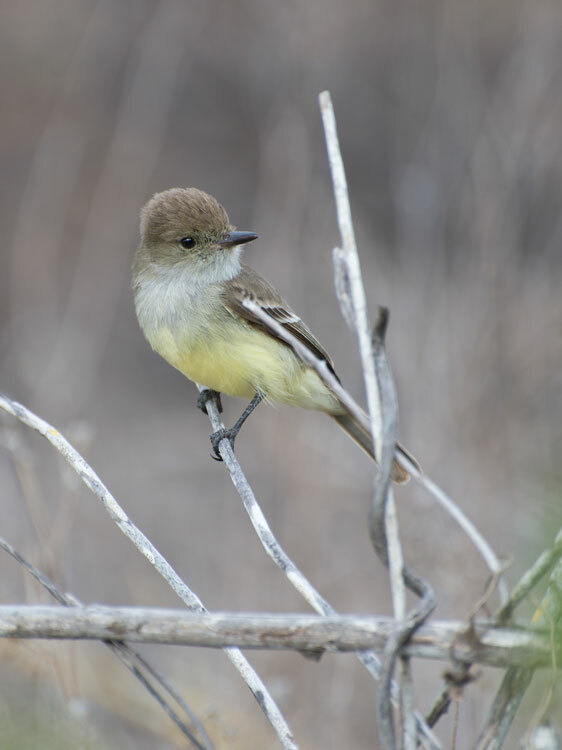 You can tell the males from the females because the males have more intense yellow colored eyes and the females are bigger. 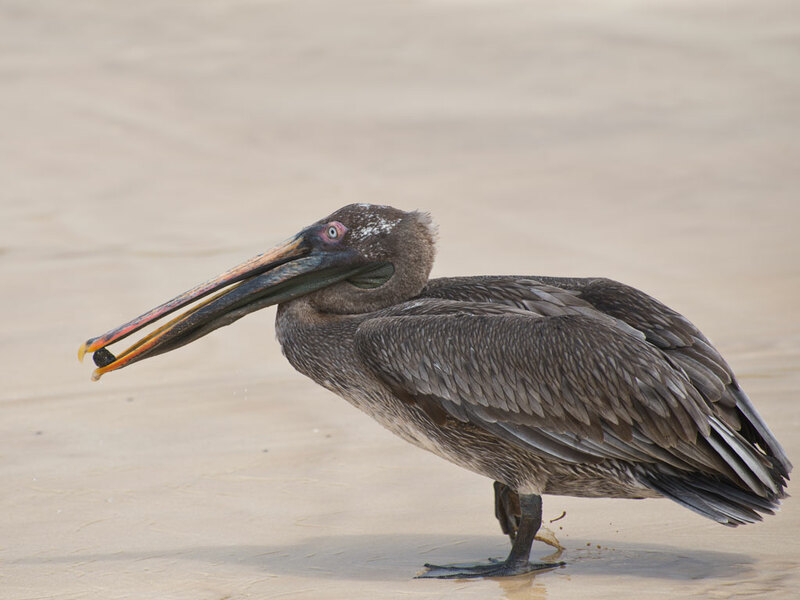 They also breath through the corners of their mouths because their nostrils are permanently closed since the Booby hunts by diving into the water dramatically from impressive heights. In addition, they have special air pockets around their brains to help them withstand the force of impact with the water as well as to help withstand water pressure as they can reach depths over 80 feet while diving. 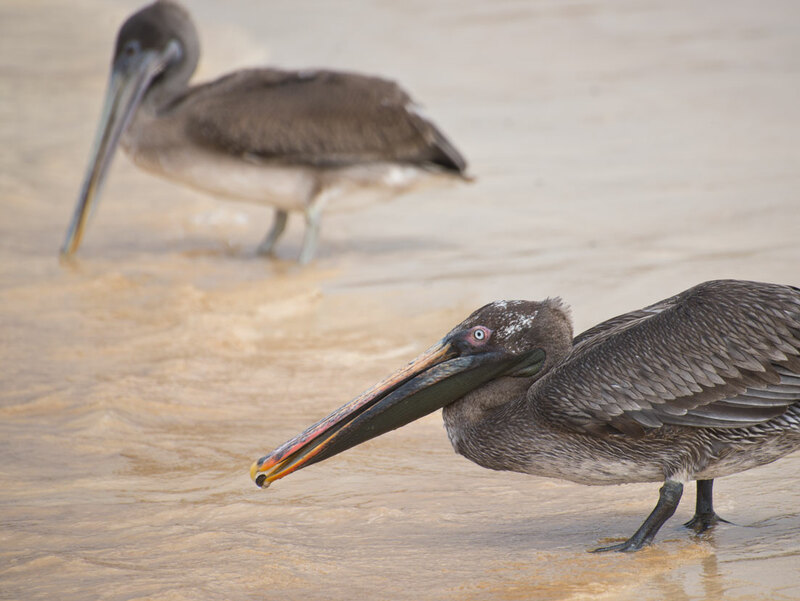 Later in the afternoon we made another wet landing at Punta Cormorant (Cormorant Point) where we did not see any cormorants (The Galapagos Flightless Cormorant is found on other islands now). We made landing on what is known as the "green" beach. The sand derives its color from olivine crystals. 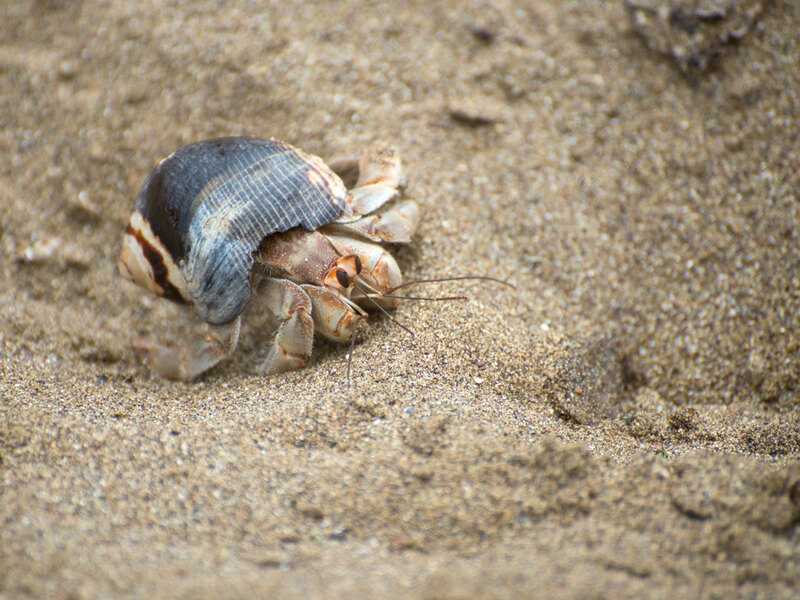 We saw several semi-terrestrial hermit crabs here. 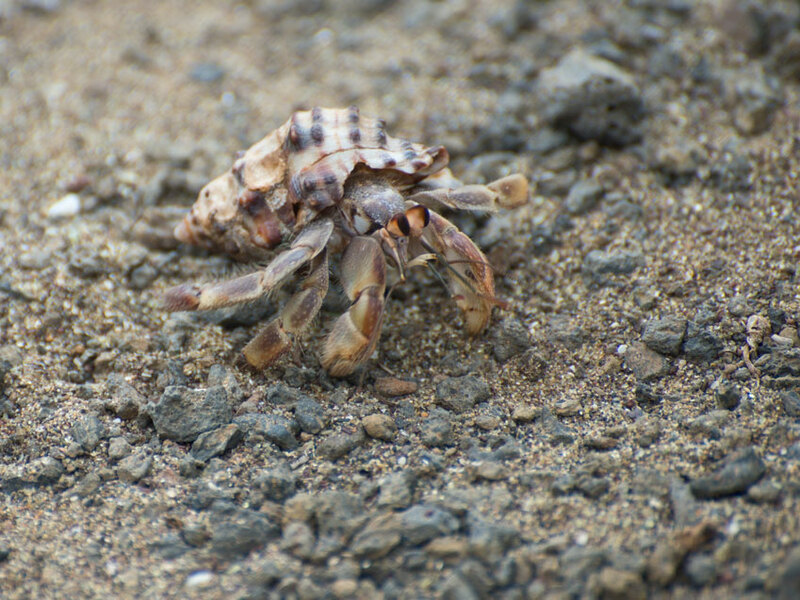 Semi-terrestrial hermit crab farther up the trail on the way to the brackish lagoon where flamingos are found. The flamingo lagoon. There aren't actually any flamingos in this photo though. We then hiked a short distance into the interior of the island to a lagoon. The lagoon is surround by the most magnificent area of desiccation cracks I've ever seen. Most people coming upon this scene would only see the dry brown, grey of the foliage and the mud but there were the most amazing subtle variations in colors: bands of browns, grays, and greens with three pink Greater Flamingos as an accent off in the distance. 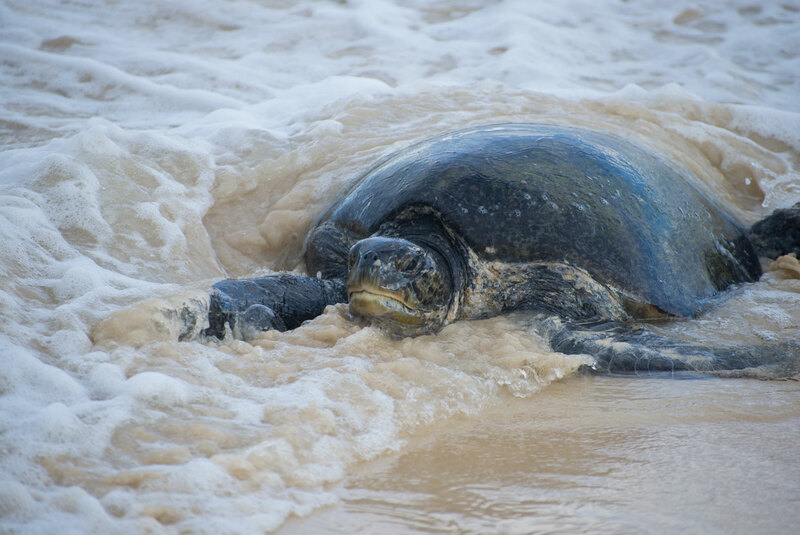 Green Sea Turtle either going to a nesting site or coming back from laying eggs. We walked farther up and into the interior and then over a hill and down to "Flour Beach." This is a white sand beach where Green Sea Turtles nest. 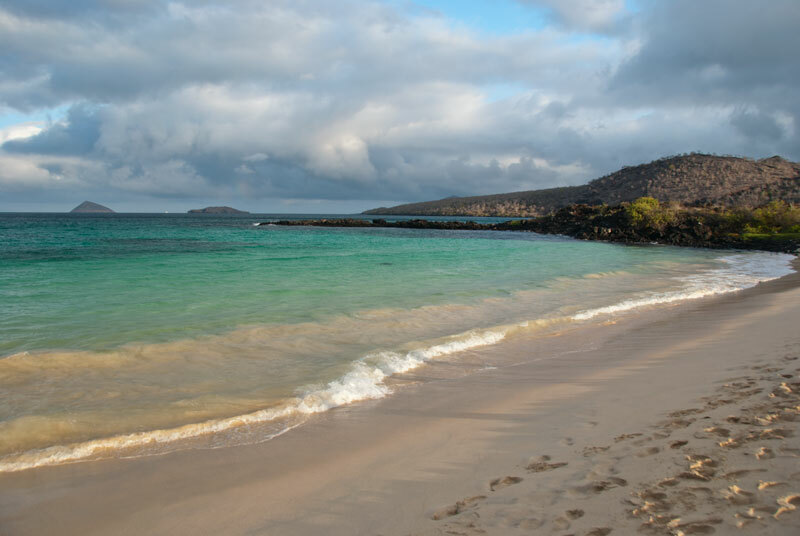 This beach is the reason to come to the Galapagos. In the waves just off shore dozens of Sea Turtles mated. One female was in the shallows. It wasn't clear if she was trying to get to the nesting area or returning from there. 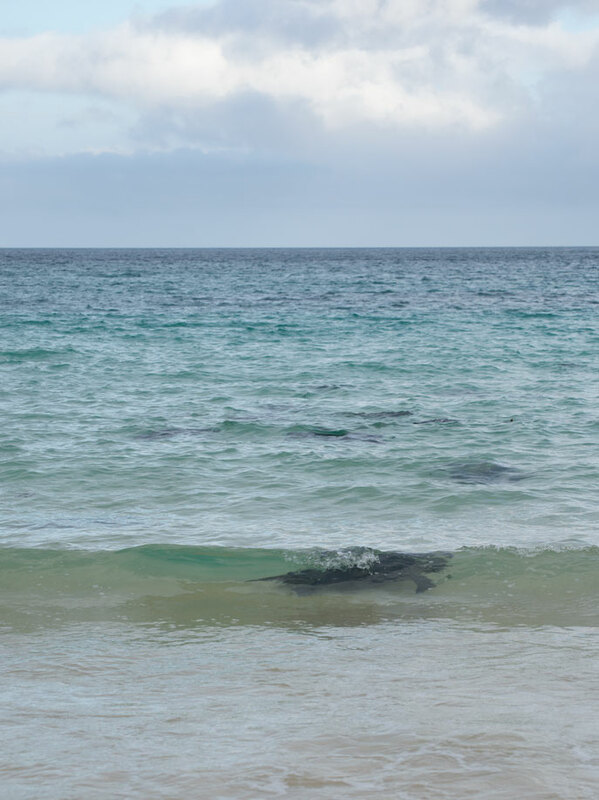 Also in the shallows, revealed as the waves crashed, were squadrons of stingrays. 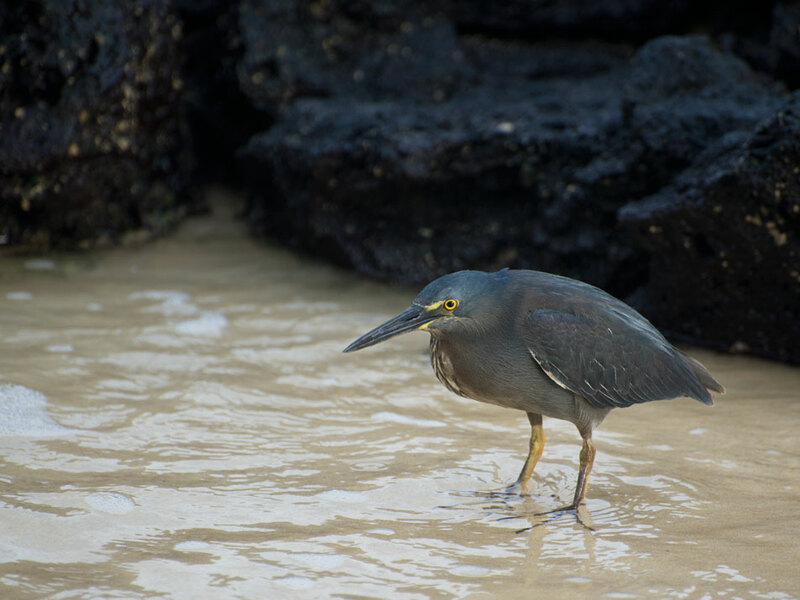 There was a Lava Heron lurking in the shallows. 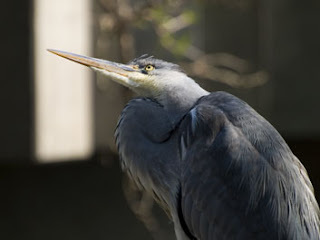 Lava Herons are closely related to Green Herons (which we have in abundance here on the East Coast of the US). 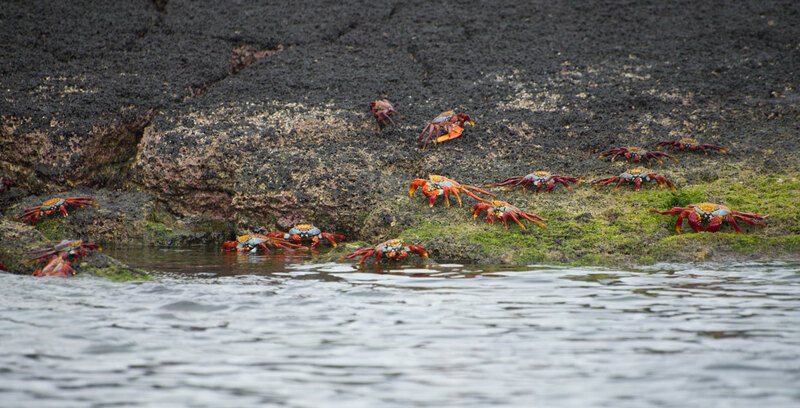 Along the black volcanic rocks hundreds of Sally Lightfoot Crabs crawled. 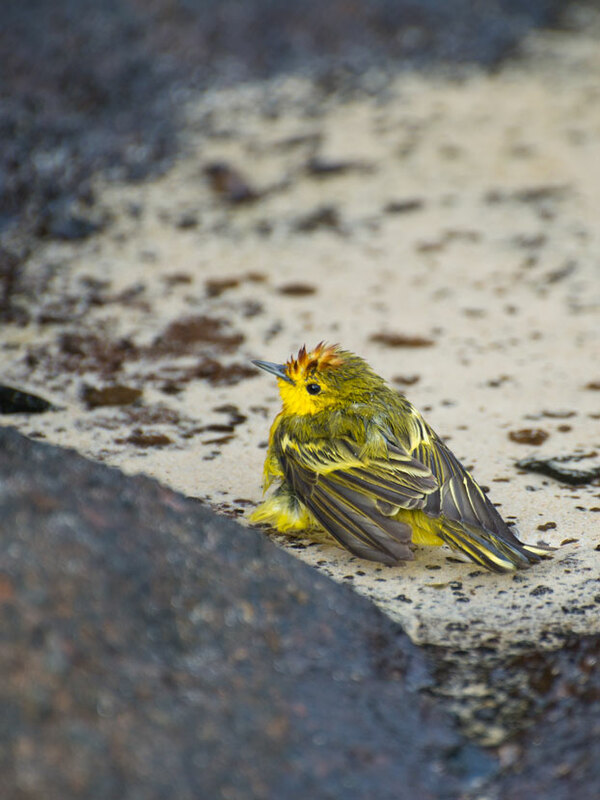 Yellow warbler bathing in a tide pool, Floreana. 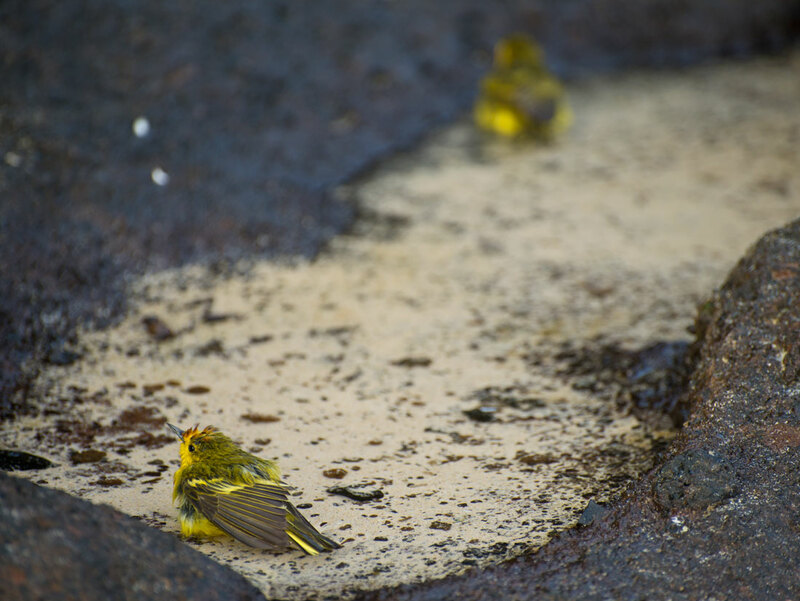 Yellow warblers bathing in a tide pool, Floreana. Also on that glorious, beautiful beach a heart-rending drama unfolded. 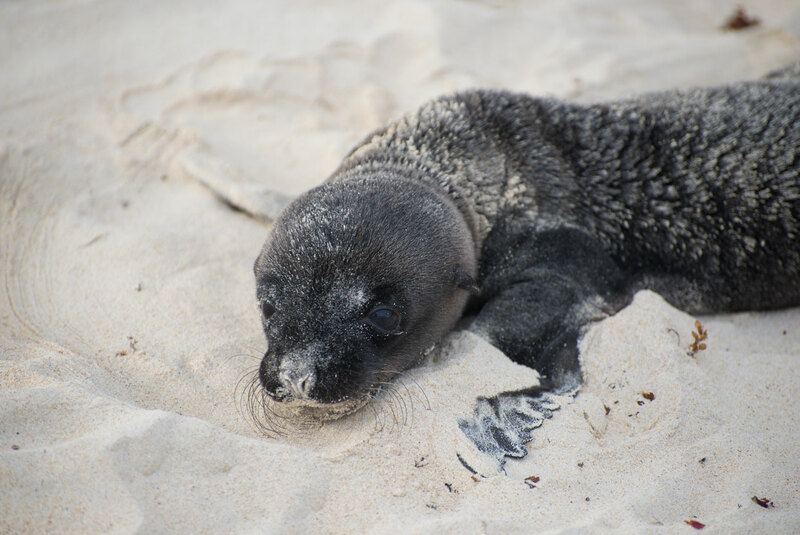 We found a just born sea lion pup laying in the sand, placenta still attached. A short way away lay its very exhausted mother. 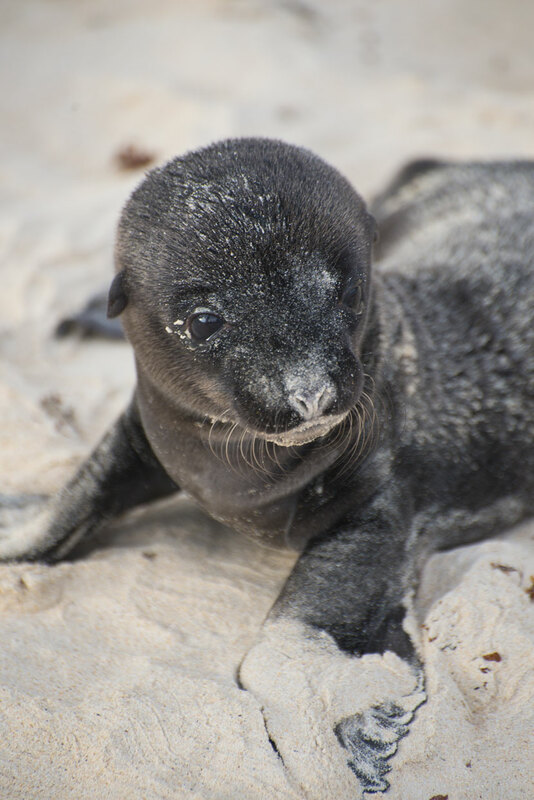 Newborn sea lion pup. You can see the placenta still attached on the right. 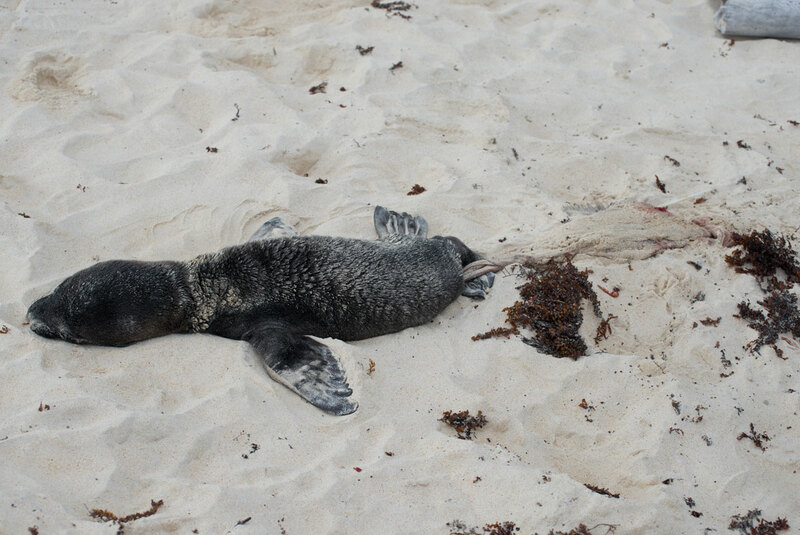 One exhausted sea lion mother, having just given birth. The pup opens its eyes. Mom opens her eyes just briefly before falling back into the depths of exhaustion. Pup manages to lifts its head up and start calling for Mom. At first the pup wasn't moving at all, just breathing. 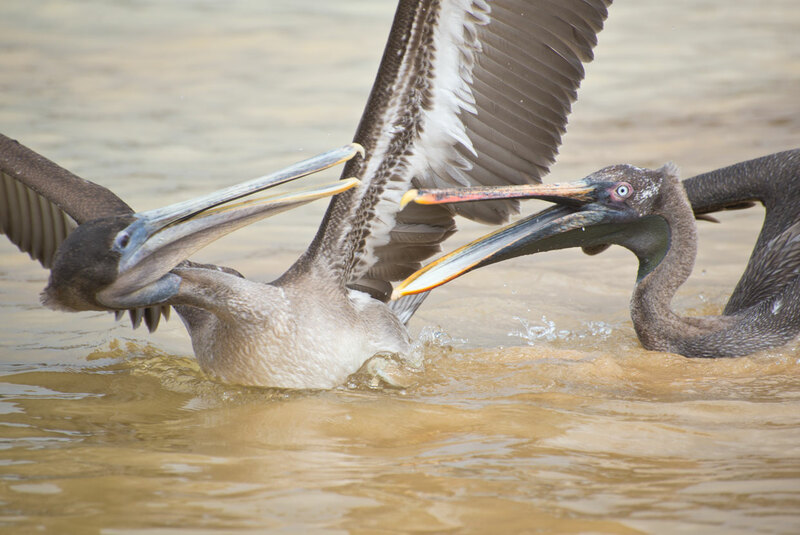 But, agonizing minutes went by and it finally started to move and then try to lift its head up and began balling for its mother. Mother was exhausted and not moving much. I honestly don't know what the outcome was for these two amazing creatures. We will never know if that pup or mother managed to bridge the 15 feet or so between them. We don't know if the pup lived or died. But I'll never forget it lifting its head for the first time and looking at me and Traveler Thirteen and crying out for the very first time. Sun sets on an incredible day, Floreana. Love your blog and photos! 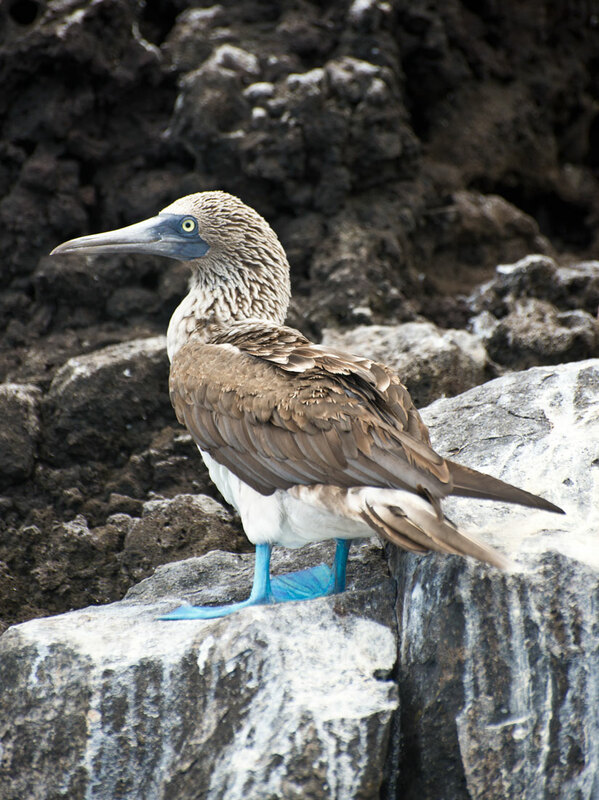 I'm looking at a trip to Galapagos next year on the Aida Maria and would love to know what time of year you went. We were there at the end of December. It's the dry season. We had great weather.